This study validates the use of smaller sized vehicles to acquire signals in areas where access is not possible by conventional large vehicles in a 3D seismic survey. The study also demonstrated the best sweep characteristics to provide high resolution imaging of the shallow sections and delivered high resolution seismic images for the shallow sediments (<1000m) in the region of the Southwest Hub. The enhanced knowledge of the fault patterns at shallow depths also contributes to improved decision making for planning the next phase of reservoir characterisation activity at the site. In any geological storage project it will be necessary to characterise the reservoir from core samples taken during exploratory drilling. This project uses four co-located specialist laboratories at the Australian Resources Research Centre (ARRC) Perth. It was able to demonstrate the development of a work-flow for unconventional detailed analysis of the reservoir characteristics that can inform decisions and reduce risk in the initiation of a carbon dioxide storage project. The goal of the multidisciplinary work presented here is to help enable and further understand the geological and geophysical parameters that will affect the safe and efficient storage of CO2 at the proposed SW-Hub site in the Southern Perth Basin. In particular, the areas of interests covered by this work are related to the characterization of the geological units intersected by Harvey-1 in terms of storage capacity; injectivity and containment potential; elastic and mechanical properties and heterogeneity of the formations encountered. One of the first planned onshore commercial-scale CO2 geosequestration projects in Australia is at the South West Hub site, approximately 150 km south of Perth, WA. As part of the detailed characterisation work at the site, the new Harvey-1 Data Well was drilled in early 2012 to approximately 3km depth, penetrating the Lower Lesueur formation which is the main CO2 injection target. 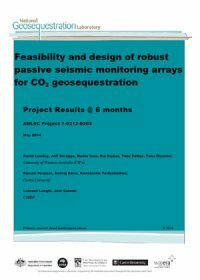 Its purpose was to obtain rock core samples and other physical data to reduce gaps in geological knowledge and help assess the suitability of the formation for CO2 storage. Drilling of the Harvey-1 Data Well has provided several geophysical data sets, including log data and zero-offset vertical seismic profiling (ZVSP) data. In addition, a set of 2D seismic lines was acquired in 2011, with basic image processing performed by a contractor. 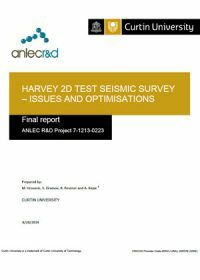 The main goal of this ANLEC research project is to apply a range of advanced data analysis techniques, developed by (or available to) WA:ERA researchers, to the geophysical datasets acquired at the Harvey-1 data well and the recently acquired 2D seismic data, in order to extract higher value from the data, reduce risk in the SW Hub CCS project through improved storage site characterisation, and guide optimal acquisition and processing parameters for future geophysical surveys. 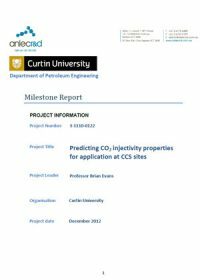 This project aims to investigate the injectivity of potential Australian carbon storage reservoirs, and to provide some understanding of their capacity to store CO2. A parallel work-flow is developed to allow the efficient movement of a core sample through the four laboratory test stages. Berea sandstone core is used to commence tests as a standard calibration example due to its well-documented characteristics in the international literature. Three other cores are tested afterwards, namely Otway (Waarre-C), Pinjarra-1 (Lesueur) and Harvey-1 (Lesueur). Geomechanical tests and CT scanning are performed and the results provide new insights into the injectivity of CO2. This 2012 milestone report is followed by the 2014 final report. 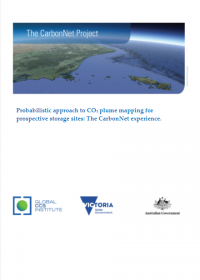 Supported by ANLEC R&D, CSIRO and Curtin University are jointly conducting an assessment of the site specific resources that are geographically co-located with proposed carbon storage. 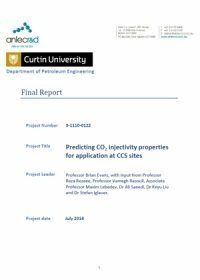 The project also aims to understand the structural, stratigraphic and geomechanical aspects at proposed storage sites in the Southern Perth Basin, the Gippsland Basin, and the Surat Basin, in Australia to assess the potential impacts of CO2 injection on adjacent resources. This literature review and data gap analysis forms a first step of the study to understanding the present level of knowledge for conducting such an assessment. The literature reviewed relates both to any direct assessment of potential impacts of CO2 on other natural resources, as well as those that contain valuable information that would be used for making such an assessment. These include reports on hydrogeology and groundwater prospectivity, hydrocarbon and coal occurrence, geomechanical and structural assessment, and other relevant site specific studies on carbon dioxide storage.